Well, the rainy season has finally arrived. I know I said that before, but this time... well, it has rained a couple of days, anyway. For all I know that might be it. This morning, near my house, it rained steadily, and then briefly stopped. That was enough for me; I got dressed and was on my bike at about 10 AM. 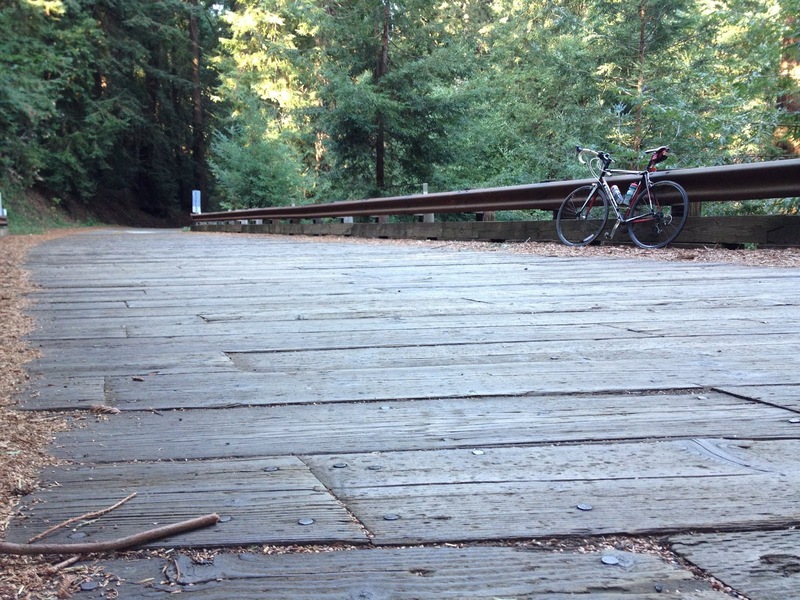 Somehow I had decided that I would ride through Boulder Creek and up to Saratoga Gap, which I've done before, but this time go through Big Basin Redwoods State park. I went over Kennedy to Los Gatos and up the Los Gatos Creek trail. The last couple of days of rain left puddles, but the trail remains firm free of mud despite the rain. I made my way up to the Leniham Dam, and then made a mistake. I wanted to ride up Bear Creek Road, and rather than ride all the way around the reservoir, I decided to take the dirt path that parallels Highway 17. The Los Gatos Creek trail had been pretty good, so why not? Well, that dirt path was deep with mud. My tires and shoes were caked with mud, and I ended up walking half of it. So, a lesson for myself: avoid that dirt path after rains. As I rode up Bear Creek Road the rain was intermittent, and never heavy enough to soak me. I think I got pretty lucky. Nonetheless that dampness froze me on the other side of the hill, coasting into Boulder Creek. I stopped at the grocery store for a coffee, which helped a lot. Having finished the coffee, I started up Route 236, the Big Basin Highway. This was a new road for me; I had never even driven on it. The road winds up through a rural neighborhood, then through woods. Although it gains 1000 feet, it is always a gentle grade. The woods back here are so tall, thick and covered with moss that one can't imagine a shaft of sunlight hitting the ground. It must be permanently damp. On this stretch of road I passed by Jamison Creek Road and China Grade, notorious climbs that I have yet to try. But they will have to wait. After that first hill the road descends into the park itself, and right down to a cluster of buildings that apparently includes the ranger station. Today there were lots of cars and a fair number of people, although very few bike riders. Immediately after the ranger station the road becomes single-lane, and winds up through giant trees like a garden path. By this time I hadn't been rained on for quite a while, and in fact I was seeing patches of blue sky. I'm very glad that I got out today; one never knows what tomorrow holds. This part of the road climbs up to about 2000 feet, again very gradually, before descending to about 1300 feet at the intersection with Highway 9. 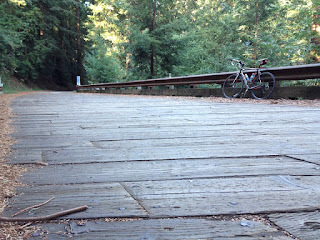 After that, it's just a six-mile slog up the road to Saratoga Gap, where I zipped up and headed down into Saratoga. I don't particularly enjoy descents, and on cold damp days I like them even less. Route 9 is a great descent, as they go, but today it was very long and very cold. When I got near the bottom I felt like I had to re-learn how to pedal. After that it was over to Los Gatos, then across Shannon and back home. Overall it was just over 62 miles, so pretty close to my 100km goal. I think it was about 6000 feet of climbing, which might be a record for me. And perhaps more importantly I got to see a new road, which doesn't happen every day. A good day out in the rain. Since I had MLK day off again (for the second year in a row! ), I decided to get in a short second ride this weekend. I wanted to see how my body would react to a substantial climb just two days since the previous ride, and I wanted to check my form. So I took a quick ride to the closest hill near me: Mount Umunhum. As usual I got moving at 9 AM. With the temperature near 40 F, I was wearing just about all the bike clothes I own. I slowly pedaled up Hicks Road, trying to generate some heat on the shaded road. I felt pretty good, and when I got to the hairpin turn on Hicks that marks the beginning of the climb, I settled in for a long slow climb. Hicks climbs for just a mile, but it's quite steep. As you can see on the diagram below, it sustains a 13% grade most of the way up, with little respite until it nears the junction with Umunhum Road. Mount Umunhum Road takes up where Hicks left off, with unrelenting 10% pitches climbing away from the junction. But after that difficult start, it gradually eases as it approaches the gate mid-way up the climb. After the gate, however, there's a steep section of a few hundred yards with a grade above 12%. But by now you're used to it, so it's not so bad. Although there were some cars at the gate, I hadn't seen a soul on the whole climb. And that includes rangers. Nonetheless, at the signs announcing the end of the preserve I dutifully stopped and turned around. 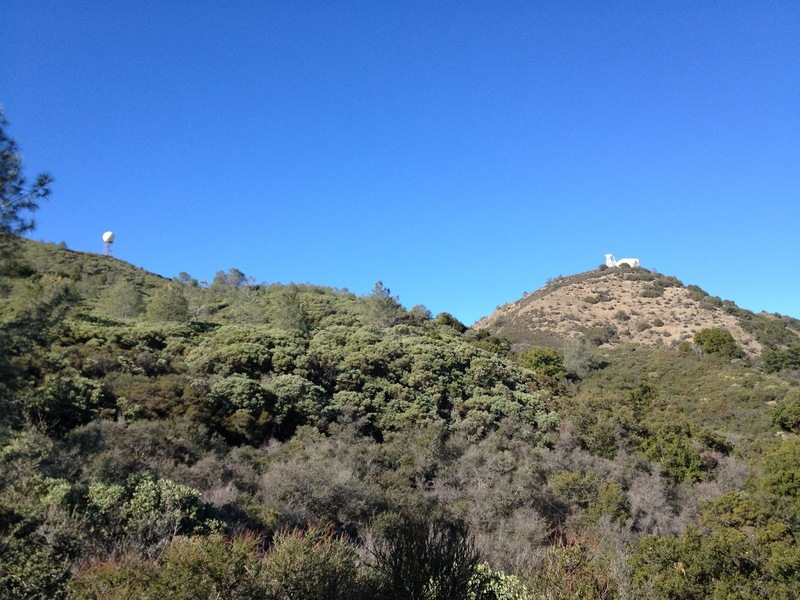 The MROSD has announced an intention to be more strict about keeping the open area near Umunhum closed (temporarily, during the permanent construction period), and I didn't feel the need to test their resolve today. I may be imagining this, but on the descent the road surface seemed substantially worse than it has been in years past. In many sections I was having trouble finding a smooth line at all, and had to keep my speed down. And needless to say, the descent was awfully cold. I descended the south side of Hicks to Almaden Reservoir. At one point I was thinking of taking McKean Road south for a bit to extend the ride, but my mission was accomplished and I decided I could be useful around the house. So I just headed back home on Almaden Expressway. I noticed no effect from my ride on Saturday -- no lingering soreness or lack of energy. So that's good. 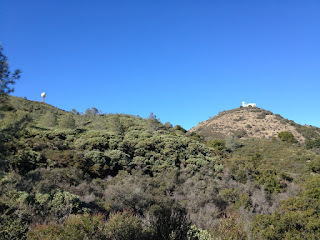 I got up Umunhum without drama, albeit very slowly. So that's good too. After all, it's a 4.5 mile climb that averages 9.5%, so it's a substantial climb. Today's ride was just 23 miles with 2680 feet of climbing, which is short but points out how lucky I am to live so close to a great hill. And, after all, today was just a bonus anyway. Yesterday's ride took me down through Capitola and Santa Cruz, then back via Mountain Charlie Road. Yesterday was a standard fall-in-winter day, starting cool and getting up near 70 F by mid-afternoon. As usual I got started at about 9 AM, heading over Kennedy into Los Gatos, and then around the Lexington Reservoir and up Old Santa Cruz Highway. I went down the San Jose-Soquel Road into Capitola, which was thick with cars. I went along the beach roads, enjoying the January surfers, odd bikes and various other sights. In Santa Cruz I got a burger at the very convenient Betty Burger, then rode up the San Lorenzo River trail to Graham Hill Road. This was the first time I've ridden this part of Graham Hill Road, and I was surprised that it climbs pretty steeply, pretty much immediately. My intention was to cut over to Scotts Valley and return home on Mountain Charlie Road. To do that, I intended to use a road called Lockewood Lane. After riding a couple of miles I was convinced that I had missed it, and would return on Zayante instead, so I was surprised when the road finally showed up. This time I avoided Scotts Valley Road by taking Bean Creek Road, which was new to me. Bean Creek Road wanders through a valley, then climbs quite steeply to meet Glenwood Drive. Quite Steeply indeed. But in that same area it's one of those one-lane wooded roads I enjoy so much, so I guess there's a trade-off. I have a new Garmin 500 bike computer, and on the climbs on this ride I was looking at its reported grade. On the Forerunner 305, using only GPS elevation, the grade was a joke, often reporting a drop while you're climbing. With the barometric elevation, the 500 is much more realistic, in the sense that the reported grades match what I'm experiencing on the road. Having said that, I don't know if it is accurately reporting the absolute grade. 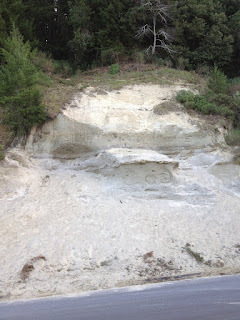 On the final section of Bean Creek Road, for example, it reported grades of up to 20%. My 100-meter calculations didn't show such steep grades, but of course they are measuring something slightly different, even if they are using the same data. From Bean Creek Road, I headed north on Glenwood Road to Mountain Charlie Road, then up toward Summit. At that point, I opted for a direct route home, so I went down the northern part of Mountain Charlie Road, then took Old Santa Cruz Highway down, onto Highway 17, through Los Gatos, then over Shannon and home. Yesterday's ride was a little over 68 miles, with almost 5100 feet of climbing. That's not an especially long ride, but for me the total climb was pretty good. 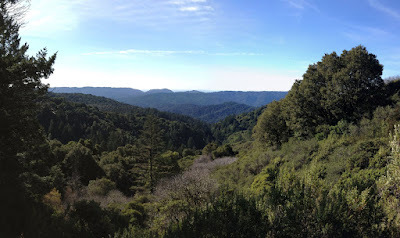 Saturday I took a nice ride along Skyline, from Saratoga Gap to the Summit area. I got started a little late, close to 10 AM, on a now-standard winter day: clear, 30s at dawn warming to the 60s in the afternoon, zero chance of rain. I took Shannon into Los Gatos, passing by (or rather, being passed by) several large groups of riders also taking advantage of another lovely day. I took the Saratoga-Los Gatos Road (aka Route 9) into Saratoga, then turned left on Congress Springs (aka Route 9) and began climbing. Route 9 is a long slog up the hill, about 5 miles of climbing at a 6.5% grade. On Saturday there didn't seem to be much traffic, which can be a problem on this road. At the top of the hill I ate a snack, then continued southeast on Skyline. Skyline is a two-lane road with skinny shoulders. It climbs from Saratoga Gap, at about 2600 feet, to a peak of about 3150 just after Castle Rock State Park. At that point the traffic lightens considerably, and of course it drops down until it meets Black Road. At that point it changes character entirely, from a two-lane highway to a single-lane paved trail, snaking between ancient trees. This is one of my favorite places, surrounded by woods with occasional glimpses across mountain ranges, very quiet with almost no cars. 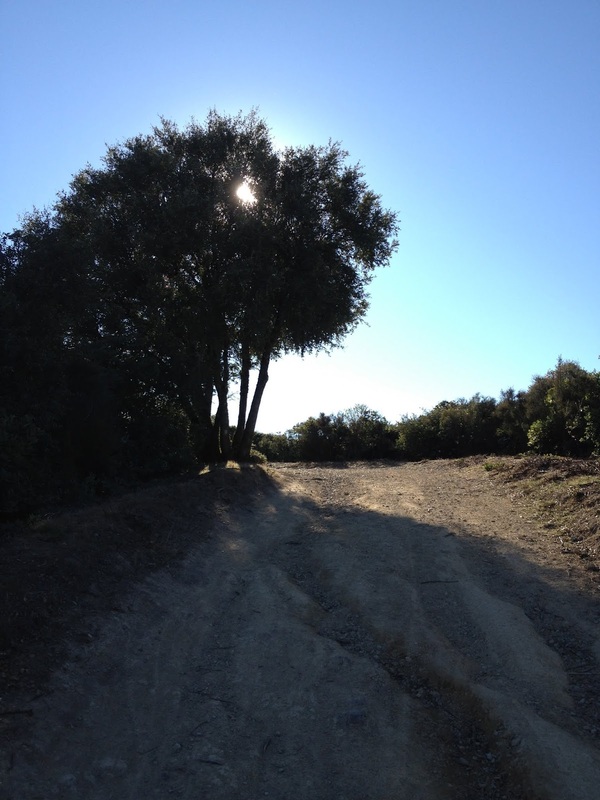 After a brief interruption at Bear Creek Road, Summit Road resumes the same nature until it reaches Redwood Estates, where it once again becomes civilized. After crossing Highway 17 I decided to ride along Old Summit Road, which was new to me. It too is a one-lane road of dubious quality, passing through a little neighborhood. Having done that, I decided I would also revisit the southern portion of Old Santa Cruz Highway (lots of "Old" roads this ride). On this side of Summit, the original concrete highway is on display, for good and ill. The woods back there are gorgeous, and this would also be one of my favorite roads, except that it's in such poor shape. The concrete is cracked, as one might expect, and in many parts the asphalt patching on top of the concrete has made the situation much worse. Still, I shouldn't complain too much; it's a nice quiet road through deep woods. It's well worth the time, even though it doesn't really go anywhere useful for a bike rider. I didn't have any other goals in mind, so I just coasted down the northern side of Old Santa Cruz Highway toward the reservoir. When I'm going this way I normally go up Highway 17, so to (very slightly) shake things up I decided to take Aldercroft Heights down to Alma Bridge Road, around the east side of the reservoir. Although I take this road all the time, I can't remember the last time I did so in this direction. I went back home over Kennedy Road. The ride totaled a little over 53 miles, which is a little shorter than my goal, but with 4600 feet of climbing, which is pretty good for me. Another gorgeous day, albeit aimless, day in the mountains. My last ride on this busy holiday was short but eventful: On New Year's Day I took my mountain bike up the Kennedy Trail. I lost my bike computer on my previous ride, so that needed replacement. I thought about just getting a bracket and extended battery for my iPhone 4S, whose GPS capabilities are much improved over previous versions and probably up to the task. But that wouldn't record my heart rate. I could just replace the Garmin Forerunner 305, but I've now lost two of them, and as far as I know there's no bracket available that's more reliable yet reasonably convenient. In addition, although the last 305 I bought was just $150, I'm now seeing them for sale at $200. That's awfully expensive if it's going to be a consumable. That higher price puts it in the range of the Garmin Edge 500, which sells for $250. The 500 has a barometric altimeter, much more storage capacity, and what appears to be a reliable mounting bracket. Sold -- I went and got one on New Year's Eve. I started off yesterday a little late, nearly noon, in cool, clear weather. The trail was very busy with hikers, mostly in large groups. I must admit that some of the faster hikers injured my pride by passing me on the way up. Having said that, I made better time than I usually do, which may be partly due to better conditioning but the perfect conditions didn't hurt. The Kennedy Trail begins with a brief uphill followed by a descent. From that point, after the first descent, to the junction with the Priest Rock Trail is about 3.4 miles with an average grade of about 9.5%. And that includes a lengthy more-or-less flat part in the middle, so most of the climb is insanely steep. It's steep enough that if you push hard on the pedals you'll lift the front wheel, which means that despite the steepness I could never get my heart beating very high. 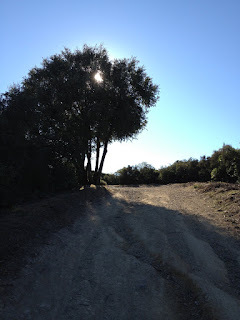 After the junction with the Priest Rock Trail I continued on toward El Sereno. As usual, I had to push the bike up the two or three steepest ramps on the way. I loathe that section. At the top of El Sereno, I normally ride up the dead end trail to the towers. There's very little to see up there, but if I ride all that way I want to know that I got to the top. Or as near as possible, anyway. 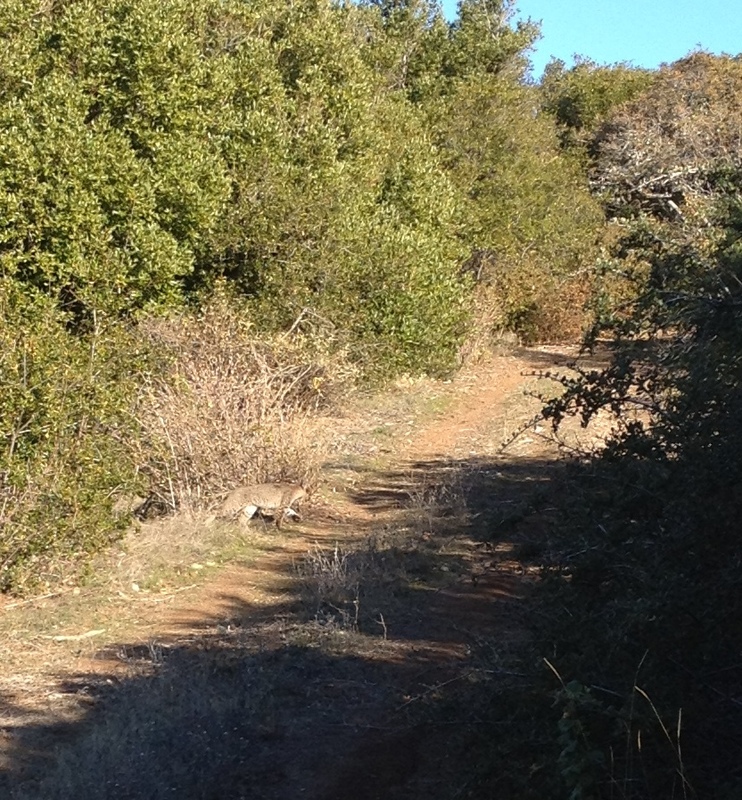 This time, when I turned onto the spur trail I saw a bobcat in front of me. I had seen it on the last ramp before that junction, slowly walking up the hill ahead of me. Thinking it was perhaps a coyote I whistled to avoid startling it later; it just looked over its shoulder and calmly continued walking. Not easily frightened, apparently. Since it was heading to the peak I took a picture, but turned around. It's his place, after all. I had a rough ride down the Wood Road. On some of the loose, broken rock just below the summit I managed to slide my front wheel at low speed, and fell. That's very rare for me... except on this trip, because I did it again a 100 meters later. Now, fully unnerved and uncomfortable on my saddle, it happened a third time. So I walked for a bit. I'm not sure what the problem was. My working theory starts with my rear brake being ineffective. I only noticed that after the first fall, so it might have been effect rather than cause. Ineffective rear brakes made me use the front brake too much, to the point that the front wheel couldn't track and eventually slid. After the first fall I was undoubtedly trying to go too slowly, which I'm sure didn't help. But all the way down, I felt like I had no traction at all. Very disconcerting. I had planned to ride down through Quicksilver, but my hands were a little damaged and my knees were sore, so I cut it short by descending Hicks and heading home. This ride was just about 22 miles, with about 3000 feet of climbing. That's a short ride, but intense, particularly in this case. The new bike computer performed well, sticking to the bike despite three (low speed) falls. Not the best of rides, but it closes this holiday break filled with lots of great riding. Now I suppose I'll return to my normal weekly schedule, once my scrapes heal.